Just in time for the upcoming April Written Knowledge Tests for the RPR (Registered Professional Reporter) and RDR (Registered Diplomate Reporter), NCRA has released new Job Analyses. 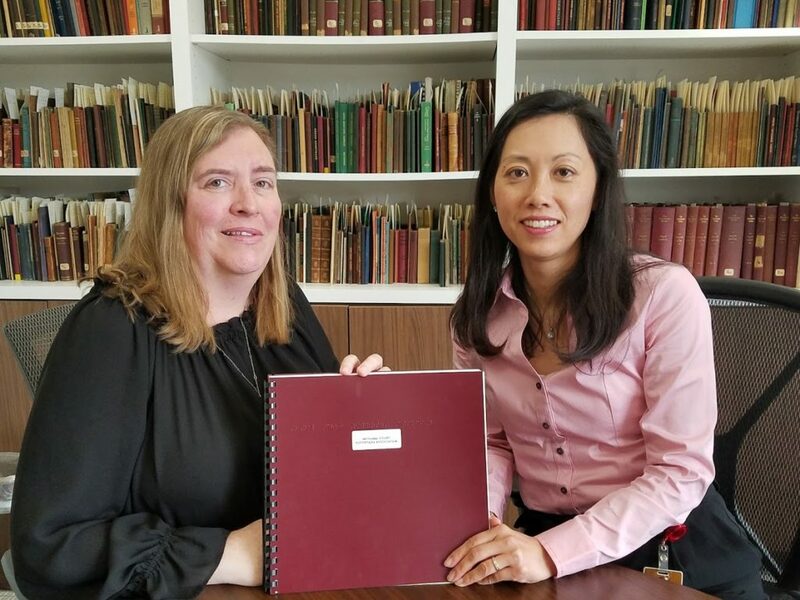 The Job Analyses describe the domains, associated tasks, and knowledge essential for court reporters working in the field every day. The Job Analyses serve as the blueprint for the Written Knowledge Tests with the domain percentages equating to the number of questions in that area on the tests. All RPR and RDR Written Knowledge Tests moving forward, including the April Written Knowledge Tests, to be held April 9-23, will be based on the new Job Analyses. The registration period for the April Written Knowledge Tests will open March 1 and close March 31. With NCRA’s new certification fees set to go into effect in January 2019, now is the time to take advantage of your chance to pass one of NCRA’s skills tests at 2018 prices. 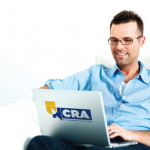 NCRA certifications are highly rated by members. 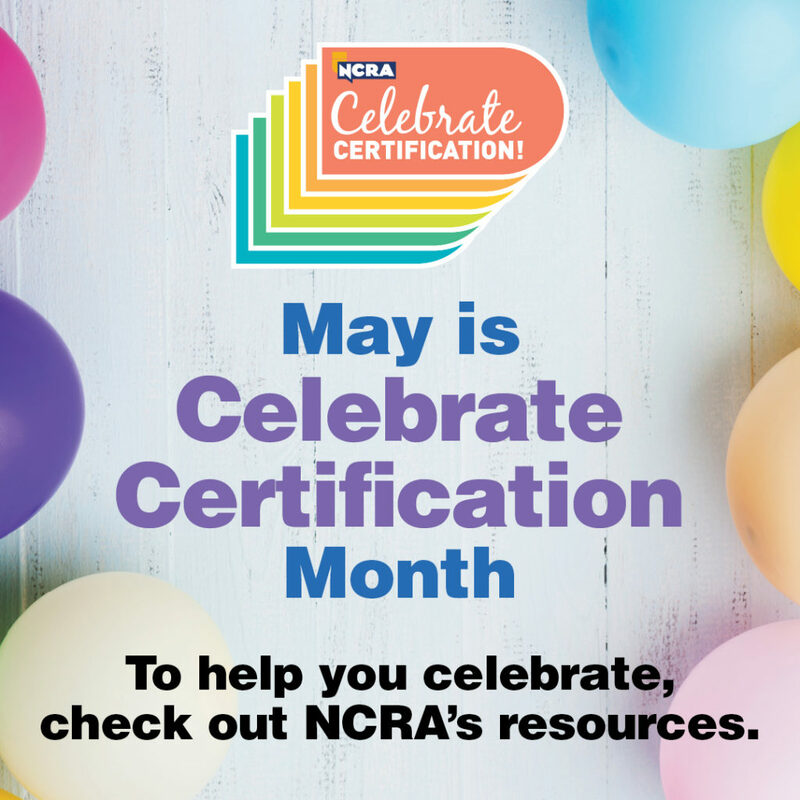 Not only do certifications help maintain standards of practice within the professions, but surveys show that those who have earned NCRA’s certifications are highly valued in the marketplace. The exams that require passing a skills test — the RPR, RMR, CRR, and CRC — are nationally recognized in the professional marketplace. NCRA strives to keep fees low for all members, especially for certification, which, for some people, can be a requirement to get work. Online skills test fees have had no increase since the inception of online testing in August 2015. Effective January 2019, all online Skills Test registration fees will increase by $5 in all categories. Don’t let this opportunity escape you. Register for the skills tests today and ring in the new year with a new certification! One of the NCRA benefits most highly rated by members is its certifications program, which test members on reaching certain standards of practice in the profession. NCRA’s certifications, which include the RPR, RMR, RDR, CRR, CRC, and CLVS, are nationally recognized in the professional court reporting, captioning, and legal video professions, and, in some states, are required for a court reporter to work. NCRA strives to keep fees low for all members, especially regarding certification, which can be required for some people to work in certain states. Online skills test fees have had no increase since the inception of online testing in August 2015. The last time Written Knowledge Test fees were increased was in 2012. The increase of 4 percent is far lower than the change in the standard of living over the same period. Who isn’t afraid of mistrans or untrans when writing realtime? I’d be lying if I didn’t admit that I am always a little nervous for the first five minutes of any deposition – especially when they enter their appearances for the record at an unintelligible 400 words per minute with their eyes glued to the realtime screen (just to see if you got it right)! I always felt terrified that if counsel saw my mistakes, I would be exposed as the fraud that I truly was. I’ve later come to realize the Imposter Syndrome is quite common! Of course, no one is perfect, but if I have errors in my transcripts, will they think I am not competent to handle the deposition/arbitration/trial? Part of my confidence-building plan from the very beginning of my career was to get every certification, accreditation, or training offered to help me be the very best realtime reporter I can possibly be! 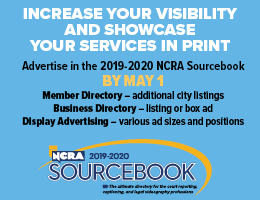 NCRA has helped me every step of the way, whether with the CRR (Certified Realtime Reporter), the Realtime Systems Administrator certificate, or the many seminars/webinars they offer. 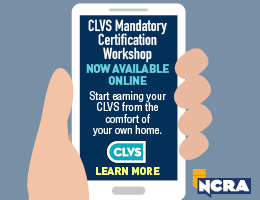 I consider myself a lifetime learner, and NCRA gives me the tools to accomplish that and more! 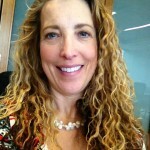 Lisa Knight, FAPR, RDR, CRR, is a freelancer and agency owner based in Littleton, Colo. She hold the Realtime Systems Administrator certificate. 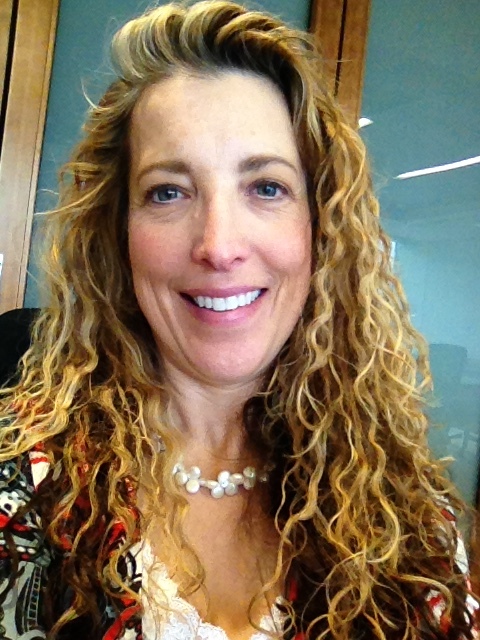 She is a member of NCRA’s Technology Committee. 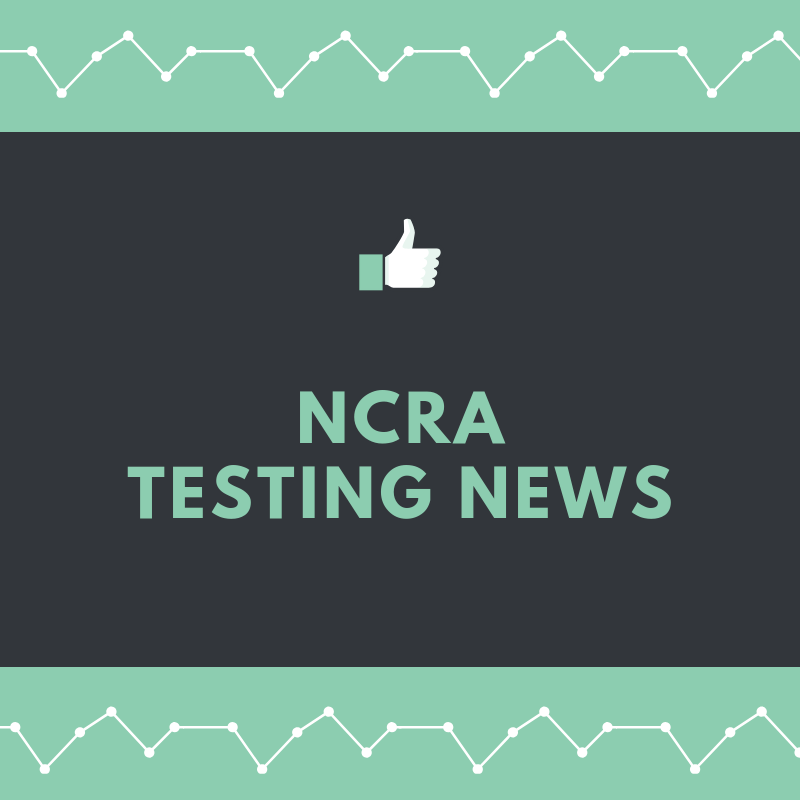 The JCR reached out to NCRA members, including volunteers on several of the NCRA committees that create and administer the skills and written knowledge tests, to get tips on passing NCRA certification tests. Whether your next exam is a skills or written test, whether it is the RPR, the RDR, or the CRC, we’ve got you covered. On Sept. 30, registration closes for the last RPR, RDR, CRC, and CLVS Written Knowledge Tests in 2018. Register now for the testing period from Oct. 8-22. 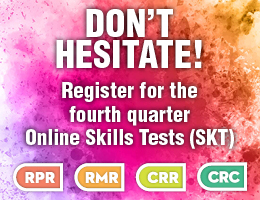 Online Skills Tests for the RPR, RMR, CRR, and CRC can be taken through December. Register now! 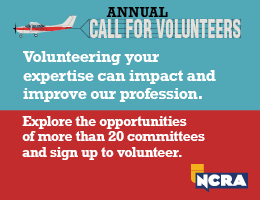 Prior to my personal experience as the NCRA Board Liaison to the Test Advisory Committee (TAC), I believed, like many others, that NCRA was intentionally out to make the test diffcult. Could they really be making these tests diffcult just to get more money? I discovered that is definitely not the case! TAC works diligently to make every test fair and passable. The process is really quite intense and amazing. I was proud to be a part of their process; I wish more people could see them in action. Both the Skills Test Writing Committee and the Written Knowledge Test Committee are dedicated to continually upgrading content and keeping the process updated and relevant. Next time you take a certification test, go in knowing that it is passable. Focus, focus, focus. Try to relax, remember to breathe throughout, and just let the words flow from your ears and out your fingers. Don’t think! Enhancing your skills by adding a new certification behind your name will definitely pay off. Certification is good for the profession as a whole as well as your personal professional stock. For any of the realtime skills tests, learning to strategically drop is key. There will pretty much always be a handful of words that they add to try and throw you. Save yourself from dropping the sentence after that hard or weird word because you were trying to write that word and just drop the hard word and move on. Take the one error and don’t look back! My number one tip would be to practice at higher speeds. No matter what kind of test you’re taking, whether it’s a realtime certification test or a speed-related certification test, anything you can do to make the words not sound so fast makes a huge difference. If you find it overwhelming to write super-fast dictation, just listen to it and let your brain get used to processing words at high speeds. Passing tests is all in your mind. If you can train your brain to process the words quickly, efficiently, and cleanly, your fingers will follow along with ease. Just like athletes train their bodies to function at peak performance, we must do the same with our minds if we are to be successful. Also, when you’re practicing for certification tests, work very hard to focus on one word at a time. If you’re listening to the context of what’s being said, you will undoubtedly get tripped up. If you write “two” instead of “too” while taking the RPR or RMR tests, it really doesn’t matter. You got the word that was said and you can correct it later. Don’t let it trip you up that you wrote the wrong one. Focus on getting a stroke for every single word, one word at a time. If you make a mistake, let it go and move on to the next word. Don’t let a small mistake turn into a 15-word drop. In the case of a realtime test, if you write “two” instead of “too,” it is still just counted as one error. Let it go and move on. Don’t allow that one mistroke to cause ten more. Take the one error, don’t let it throw you, and continue on and write the following words cleanly. It’s much easier to do this if you aren’t listening to the context of what is being said but just focusing on each individual word that is being dictated. Practice the process, not just your writing. Review “What is an Error?” before your test, so you know what to expect. I’m a strong proponent of pushing and practicing above the speed you need. If you’re aiming for the RPR at 225, you should be practicing at 240 as part of your routine. That extra speed buffer is crucial to help you feel comfortable with writing at test speeds. Practice with a “dress rehearsal” as many times as you possibly can. Test day can be a highly tense situation. However, if you put yourself through the process more frequently beforehand, the actual test will be far less frightening. I recommend purchasing audio of previous NCRA tests. Use these to go through the testing process on your own. Include the process of transcribing your test, and be sure to self-grade and evaluate your final result to determine areas where you can focus your practice in order to improve. When you finally get to your testing session, it will feel like just another day of practice. How to handle test nerves: Top NCAA men’s basketball coach John Wooden didn’t talk to his players about winning. Rather, he talked about each player striving to maximize his own potential. A player was to practice in such a way and play games in such a way that his goal was always trying to maximize that potential. I believe court reporting students should approach school and testing in the same way. The main goal of practice is to practice in such a way so that you will improve and do your best on that particular day on that test. You don’t have to pass, but just try your best. Adopting this attitude takes the pressure off achieving a certain result and frees you up to just “go for it” and do your best! If you did your best, even if you get below the required passing percentage, you have succeeded in the bigger goal. Write some high-speed material immediately before the test: Immediately before you take the test, if possible, practice for several minutes (you choose how long) at a speed at least 15-25 percent faster than the test will be, all the while striving to not drop a single stroke. This has the very nice effect of making the test seem very slow! Try to “just write” and stay right on the speaker’s words: I have found that striving to never get behind helps me pass more tests, since getting behind often ends up in dropping numerous words and not passing. I also try to “be ready” for the hard parts. Each test will have several hard parts, the rest being fairly nice material. It’s how we handle the hard parts that usually determines passing or failing. So if you can fight through the hard parts without making too many errors (especially not dropping), you’re in good shape to pass the test! Members of the Item Writing Committee work very hard to make the test questions as clear and easily understood as possible. The emphasis of the certification exams is to test the candidate’s knowledge, and all questions are written with that goal in mind. We try to avoid writing questions that are ambiguous, unclear, subjective, or deceptive. Many times a candidate will think they know the answer to a question after reading the first few words and then instinctively move toward selecting an answer without fully reading the entire question. I do this as well. As a member of the Test Advisory Committee, we go through a proposed test and answer the questions just as though we were a testing candidate. We then review the questions along with the answers. Many times, I have incorrectly answered a proposed question because I did not take that extra few seconds to fully read and re-read the question. If you are trying to pass the RPR, practice as if you are taking the RMR. Likewise, if you’re trying to pass the RMR, practice as if you are participating in a speed contest. If your state offers a speed contest, participate in that. You will probably be nervous, but use it as an opportunity to work through your nerves. You may just pleasantly surprise yourself. If you are trying to pass the CRR, practice higher than the test speed. My best suggestion is that, if you use your asterisk key as a correction stroke, you should also define your asterisk key and the final side -R key as an additional correction stroke. I found I would drag the -R key into the correction stroke, not correcting anything but adding additional errors. For the Written Knowledge Tests for both the RPR and the RDR, I suggest looking through the NCRA website COPE opinions. There’s no need to memorize them. Just familiarize yourself with them. Also, look at the RPR/RDR job analysis info found on the website. If you own any of the books that are used as reference materials, take some time to peruse those too. I find glancing through the legal citations portion of Black’s Law Dictionary helpful. Finally, I’d suggest subscribing to Merriam-Webster’s word-of-the-day email and reading it. Always get a good night’s sleep the night before and surround yourself with positive people who will love you no matter how you do on the test. Before I start dispensing advice, let me first say congratulations to you! 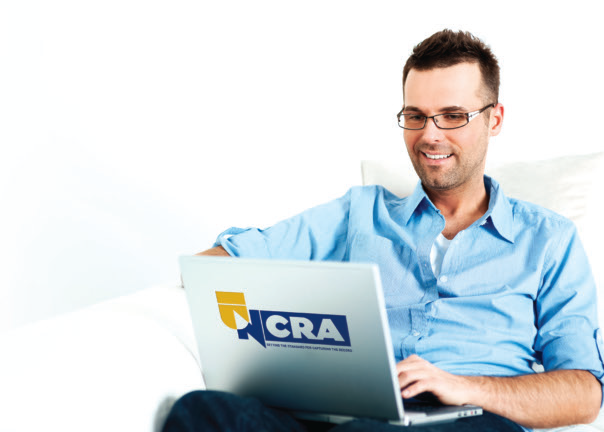 By challenging an NCRA certification exam, you are investing in your career and our profession. In my book, you are already a winner. The surefire way to pass a skills test is to accurately write every word, and you should be practicing with that goal in mind. When you’re falling behind or dropping, analyze that section of the dictation. Practice the challenging words, look for phrasing opportunities, and then write it again — and again and again. As you strive for perfection, it is equally important to prepare for the very real possibility that you may not achieve it on test day. What if you’re falling behind? What if some of the vocabulary is making you freeze like the proverbial deer in the headlights? 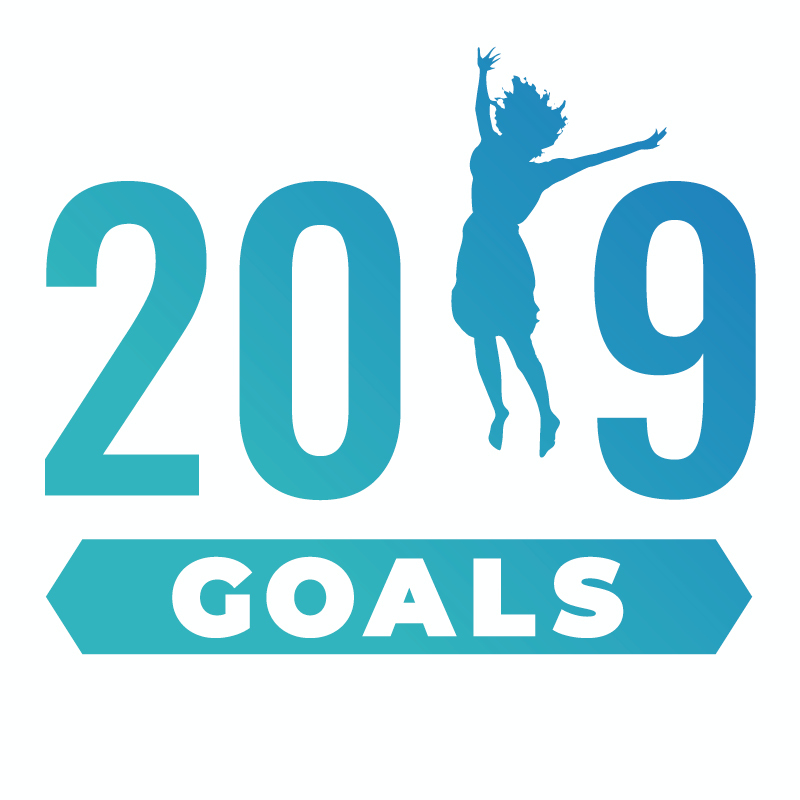 Again, take an analytical approach, decide how you are going to handle these challenges, and then incorporate those strategies into your practice. The first rule of speed tests is: Don’t get behind. You are far better to drop three or four words than to hold on too long and end up dropping a complete sentence. Once you recognize the validity of the concept, you are free to drop words and move on without beating yourself up about it. Before you start a dictation, decide that you will never get more than four words behind. Now practice it. Make the quick decision to drop and don’t second-guess yourself. On a 225 Q&A, you are allowed 57 errors. Even if you dropped every 30 seconds, that is only 40 errors. While we are all about words in our business, don’t ignore the math. Since we are talking about numbers, consider the fact that dropping “consortium” is the same as dropping “can.” Think about what you will do when you come across vocabulary that makes you hesitate and fall behind. What if you just write the first stroke and hope that you can figure it out from context? What if you write something and hope that you can remember later? What if you don’t write anything at all? They are all valid strategies. Pick one and then practice it. Before you start a dictation, decide that you will use this strategy for every big word that isn’t a brief. Be sure to take a few minutes after to review your notes and transcript; you might be surprised. Let me give you an example. Looking at an RPR literary test that I recently wrote, there are 22 four- or five-syllable words. Only one of those words occurs twice. Out of those, there are two words that I would write in three strokes. The rest are one or two strokes, and the majority of those are common words like “information,” “particular,” and “conversation.” Now, I have been at this a long time, so perhaps I have more briefs than you. The fact remains that out of exactly 900 words, only 22 could be considered big. If you dropped every one of them, you would still have room for 23 more errors. Disclaimer: These next two strategies might not be the best if you are taking the CRR or CRC! Hopefully, you are a stickler when it comes to writing punctuation. In a testing situation, however, dropping a comma or an apostrophe could buy you that extra second that you need. Practice it. Proper nouns can be a challenge. Decide how you are going to handle that name the next time you hear it. They do have a tendency to recur in a test. Practice it. As you are preparing for your certification exam, your goal should always be perfection. Your fallback goal is minimal errors, and that is where these strategies come in. You need to practice dropping the same way that you practice not dropping. Remember that no error is fatal. When you drop, don’t think of it as a failure. Instead, pat yourself on the back for making a “calculated” decision because, after all, it’s all about the numbers!